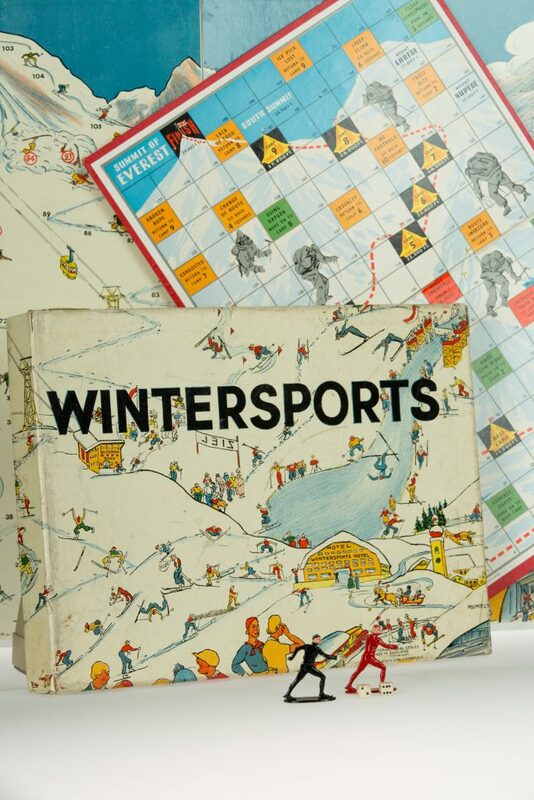 The sporty board games that are my #26winters inspiration initially gave me a warm blast of nostalgia; remembering holidays playing endless family bouts of Scrabble in front of log fires. But after research, these vintage games revealed connections to historical events that imbued them with something more than just imagined memories of family fun. The Winter Sports game dates from 1936, the year of the now infamous ‘Nazi’ Olympics. This was where Jesse Owens unexpectedly won 4 gold medals and struck an indirect blow against Hitler’s rising power and tide of racist propaganda. The second game celebrates Edmund Hillary and Tenzing Norgay’s epic 1953 ascent of Mount Everest that finally saw the peak conquered after so many failed attempts. Both items reflect momentous events, that like the playing of board games, saw the rise of ambitious individuals to the top through a combination of strategy, dedication and chance. As I started writing my Sestude, I liked to imagine these games were bought and played in innocent excitement, perhaps received as Christmas gifts. But now decades have passed, they stand as more than that, for they are colourful childhood markers of history and its different sized battles both won and lost.